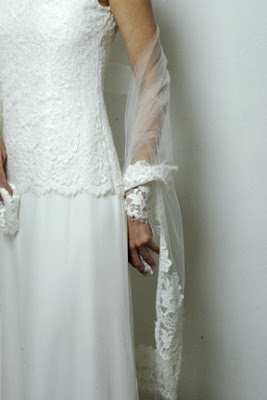 What could be more bridal than white lace? Lace as we know it evokes images of woven florals and scalloped edges on flounced skirts and collars. 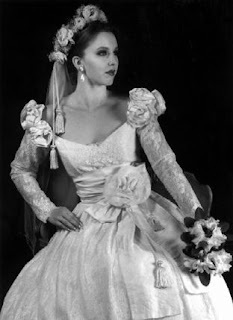 Though these time-honored looks will always be with us, lately we’re seeing new spins on the use of lace in bridal wear. Not only are the traditionals like Alencon and Chantilly now used in cutting edge ways, new inventions in knit and revivals in cotton and crocheted laces are showing up. Some of it is being used discreetly on no more than a sleeve or yoke while the high drama of donning all over lace from collar to hemline is chic as well. Colored laces in designer collections range from the palest cream to dark ecru and pastels. I’ve even spotted some water-colored peau d’ange laces in a custom collection. Here are some gowns—all lacy in some way-- that combine aspects from the finest eras styled with the contemporary bride in mind. Above and below: What could be more practical than these romantic looking separates? The history of lace making deserves an entire book or docudrama in itself and the art of making it goes back in time further than some fabric weaving. Knotting techniques actually trace back to basket making. 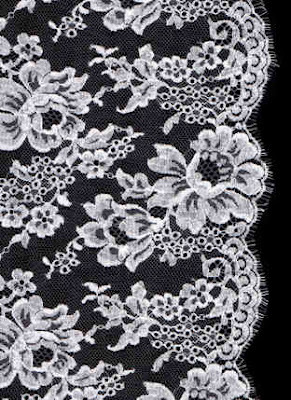 As lace making evolved into an art form, so did demand for it. Alencon-Floral patterns on mesh or net background outlined in cording. Has a three-dimensional look. Chantilly-Floral or foliage designs on a net background. Generally has a scalloped edge. Cluny-Crocheted lace in heavy cotton also known as Irish lace. Chic in the swinging 1960s for mini wedding dresses and granny gowns. Eyelet-Actually a woven cotton with eyelet cutouts and embroidery. Peau d'Ange-Delicate version of Chantilly lace made with a flossier yarn. Schiffli-Embroidered design on a mesh or organza background. Typically has a scalloped border. 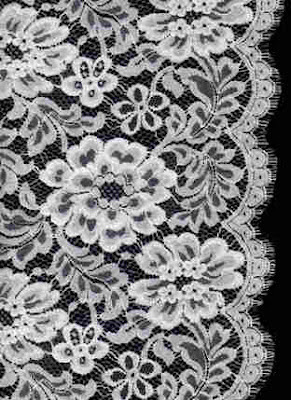 Venice-Heavy lace with raised designs. Usually a single motif with an open background. Above Left: Allover Chantilly lace wedding dress.